Just before 2:00 this morning, I finished and closed this book by Gregory Zuckerman. A real page-turner. Lots to think about. As I sip my morning cup of Lombok coffee, now I have to figure out what it means. In October 2004, Paolo Pellegrini first brought to John Paulson the idea to buy insurance against losses from securitized real estate debt instruments. Unlike shorting, the downside risk is limited to the annual premiums. Works just like car or life insurance. Difference here is that you don’t own the debt instrument (collateralized debt obligation: CDO), just the insurance (credit default swap: CDS). Unlike insurance, though, you can buy the CDS without an ‘insurable interest’. If enough debtors (homeowners) default on their mortgages, the security backed by a pool of mortgages (CDO) loses value and the insurance holder wins. It alls sounds relatively innocuous until we look at how the CDO market spun out of control. Joe Average buys a house and takes out a mortgage from the Bank. The Bank, in turn, sells this mortgage to someone else. It goes into a pool of mortgages, and the buyer of this new mortgage pool pays an amount of money to the Bank based on the assigned risk for the new homeowner. As a holder of the pool-based asset-backed security, the CDO buyer feels that his risk is diversified. The Bank has made money on the first transaction (through fees) and now has replenished its cash supply. It’s ready to lend again. This process repeats itself, effectively multiplying the volume of money in circulation in this market. The original lender (the Bank) is progressively encouraged by the cycling of fee revenues to keep issuing new mortgages and then passing the default risk on to the pool holder. Thresholds of creditworthiness steadily drop until anyone who can fog a mirror can buy a house. The real estate market was in a boom and home buyers were encouraged to believe that their properties would be worth much more very quickly, enabling them to acquire equity where before there was none. This is called ‘the greater fool theory’. Pay more than perhaps you should in the belief that someone else will pay still more later. This is the genesis of a bubble. With all the new pools of mortgages, the market began to assign discriminating levels of risk. Pools were split into many different classes based on the risk profiles of homeowners. John Paulson (and others) placed bets that at least some of these pools would fall to a zero value when the housing market slowed down. We all know what happened next. House prices slowed, stabilized, then went down. Even at stable prices, homeowners who had purchased with little to no equity were unable to make their payments when interest rates were reset at higher levels. Just as house prices had risen in a panic (fear of missing out), those same house prices dropped in a panic. Then, the doo-doo really hit the fan. As more homes hit the market (having been claimed in default), the supply side put more homes into jeopardy of default. A highly leveraged market offers huge potential to reward participants quickly. As the rubber band tightens to its limit, however, the spiralling return to Earth becomes just as dramatic. … but that’s not what this book is about. This is just the front story line to a study of people. 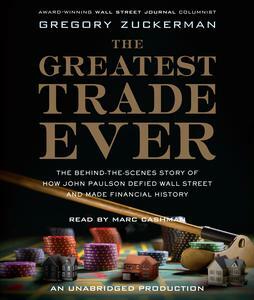 The book walks through all the detail of the rationale for the ‘trade’, setting the stage for Paulson to move from obscurity to having George Soros call, asking for a tutorial. The back story is about self-assurance and nerves, ambition and reputation, relationships and life balance, fear and hesitation, and presentation skills complemented by deep analysis. In the same way that we all paid to watch the movie Titanic, already knowing the ending, this book is a worthy read as a study of how a handful of people navigated their way through a complex maze of very messy business. Transparency was virtually non-existent. Regulations served little positive purpose. Manipulation and deceit were the order of the day. What’s more, John Paulson brought no direct related experience to the table. In the beginning of this story, he knew literally nothing about real estate. He was a complete outsider with no great reputation to speak of. His ideas were scoffed at. All the ‘experts’ were heading in an opposite direction. Yet, by the climax of the story, John Paulson was calm, sitting in the eye of a very large storm. In one day, he made over a billion dollars, almost matching Soros’ entire winnings from his bet against the British pound in 1992. By the end of 2008, Paulson’s fund had gained many times that amount, with his own personal take tallied at more than six billion dollars over a two-year period. In the early days of this ‘trade’, Paulson was plagued by uncertainty. Nagging doubts toyed with him. For some time after he entered the trade, the unknowns encircled him, affecting his relationships and, importantly, returning him continually to the analysis table. He kept asking himself: What’s wrong here? Doesn’t anybody else see what I’m seeing? Why don’t they? These guys are the experts. What am I missing? Steadily, Paulson moved from Knowledge Quadrant II (I don’t know, but I know that I don’t know.) into Quadrant III (I know, but I’m not 100% sure that I know.). This migration was a function of nothing more than doing his homework. Study, study, and study again. When he finally figured out what the ‘experts’ had missed (read the book! ), he moved into Quadrant IV (I know, and I’m damn sure that I know.). What he learned by doing his homework was that the market makers were still operating in Quadrant I (They didn’t know, and they didn’t have the first clue that they didn’t know.). They exemplified the arrogance of success, and the complacency of a continually rising market. Success, in the absence of constant study, is one of the best predictors of failure. At times, the market went against Paulson’s trade, but he was content to just sit on it. He knew what he had, and needed only to wait for the general market to figure it out. Eventually, this rubber band had to unwind. When it did, he was ready. As his gains on paper continued to rise in 2007, all around him pressed Paulson to crystallize his profits. He just smiled and waited… and smiled and waited… and smiled and waited. That’s what comes from doing your homework. In the end, even as Paulson began to unwind his investments and claim his winnings, he saw yet another opportunity. If he was winning, somebody had to be losing. He bought more insurance, this time on the default of those who had sold him the insurance in the first place, and from whom he was already extracting billions of dollars in payouts. Kaching! Paulson worked this trade over a four-year period, from conception to exit. He put it all on the line, his wealth, his reputation, his time and energy. While he held insurance on many different instruments, this play was not well diversified. His bet was on one thing. As a result, he was compelled to know that thing inside and out. Homework, homework, and more homework. Without it, he would have been cooked. With it, he both survived and thrived. At the end of the day, here’s my takeaway. Turn off the TV. Nothing there anyway. Acknowledge that you’re operating most of the time in Quadrant II. Identify the holes in your knowledge base and figure out how to close the gaps. Study, study, and study again. Much more fun than TV… and hopefully pays better.